Viewing entries tagged "NCDHC Impact"
We love being sent or just stumbling upon, projects on the web that utilize materials digitized through the North Carolina Digital Heritage Center. We thought since they have done such a great job highlighting us, it’d only be fair to turn around and highlight a few we’ve found recently. 1 Adams Alley, a house torn down during Urban Renewal in Durham. Adams Alley no longer exists as an address. Today’s focus is on a website that’s associated with larger project at Duke called Bull City 150. Durham celebrates it’s 150th anniversary this month, so it feels appropriate to highlight this project in April. According to the website, “the mission of Bull City 150 is to invite Durhamites to reckon with the racial and economic injustices of the past 150 years and commit to building a more equitable future.” The project does this through a variety of public history methods, including the associated website that features several videos put together by students in Documentary Studies classes at Duke. Two of those videos, one on the important role of the Carolina Times and its’ long time editor, Louis Austin in Durham’s black community, and one on the destruction of Hayti in Durham when the Durham Freeway, Hwy 147, was built, feature materials digitized by DigitalNC. 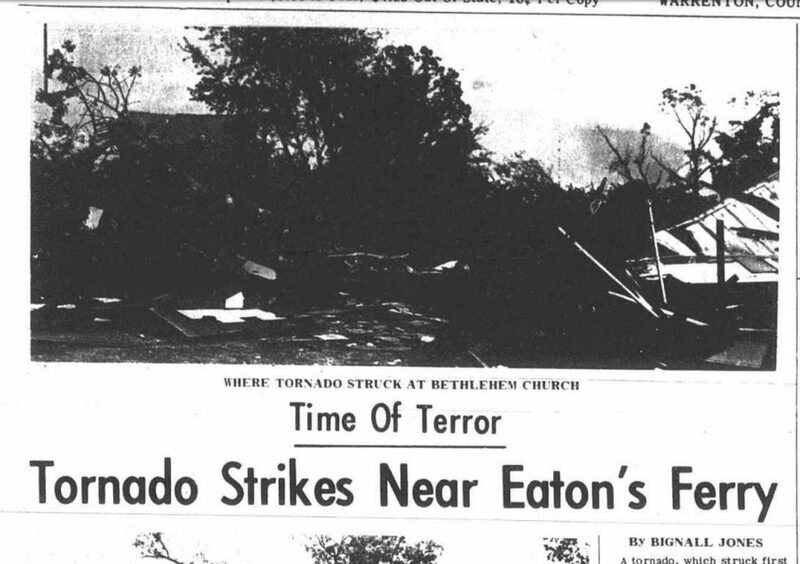 We have the full run of the Carolina Times available here and many photographs and property surveys digitized for the Durham Urban Renewal Collection from our partner Durham County Library, are featured in the Hayti video. If you have a particular project or know of one that has utilized materials from DigitalNC, we’d love to hear about it! Contact us via email or in the comments below and we’ll check out. To see past highlighted projects, visit past posts here. The museum has selected various events from 1933-1945 for people to focus their research on finding articles about. 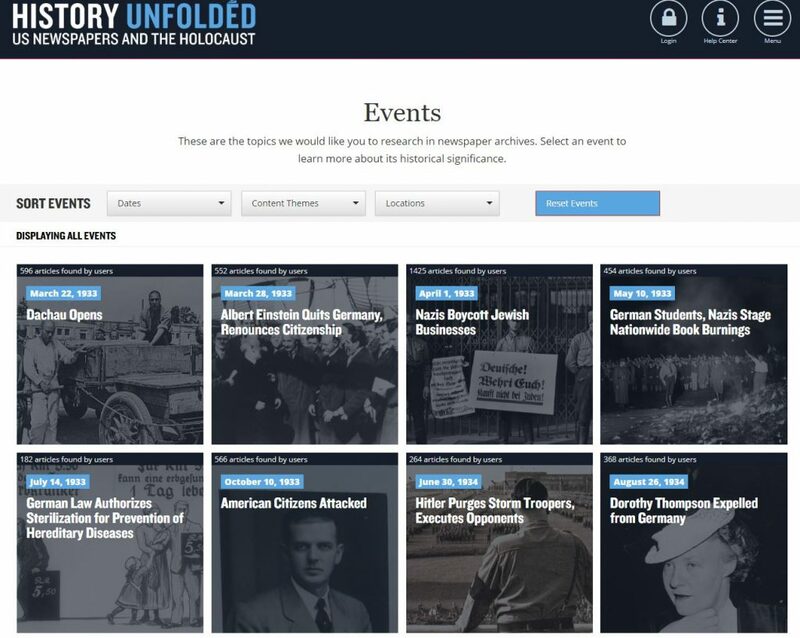 The History Unfolded: US Newspapers and the Holocaust Project from the United States Holocaust Memorial Museum in Washington, D.C. is a project in which DigitalNC materials are just a small portion of a much bigger effort. According to the project’s website “asks students, teachers, and history buffs throughout the United States what was possible for Americans to have known about the Holocaust as it was happening and how Americans responded. Participants look in local newspapers for news and opinion about 37 different Holocaust-era events that took place in the United States and Europe, and submit articles they find to a national database, as well as information about newspapers that did not cover events.” The goal of the project is to build a crowd-sourced repository that scholars can use to better understand what those in the United States knew as the Holocaust was happening. Digitized newspapers are a key component of the project and many of the papers we have digitized through DigitalNC have been used by participants of the project to track knowledge of Holocaust related events in local NC newspapers. You can view everything that is from an NC newspaper here. 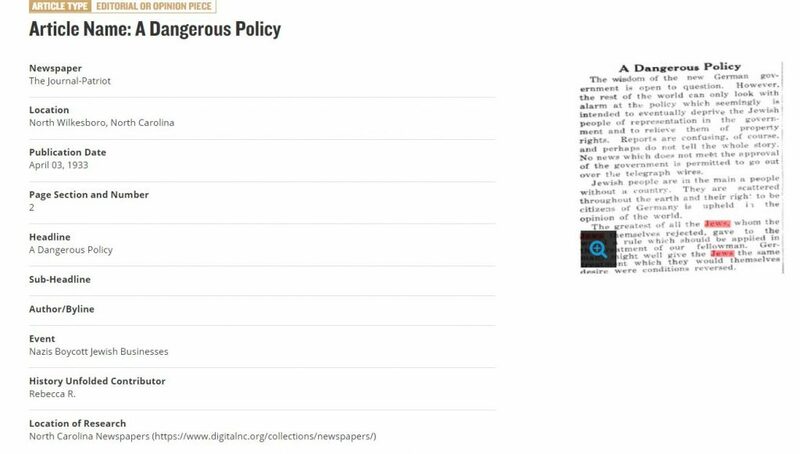 The earliest articles come from 1933, including an article from the Journal Patriot out of North Wilkesboro, NC that has the headline “A Dangerous Policy” regarding the Nazis’ growing policies against the Jewish people in Germany. The latest articles date to 1945 and focus on the evolving information being uncovered about the full extent of the Holocaust once the Nazis had been beaten in World War II. As History Unfolded is a crowdsourced project you can get involved and help the museum continue to track this information in US newspapers. To get involved yourself, visit here. 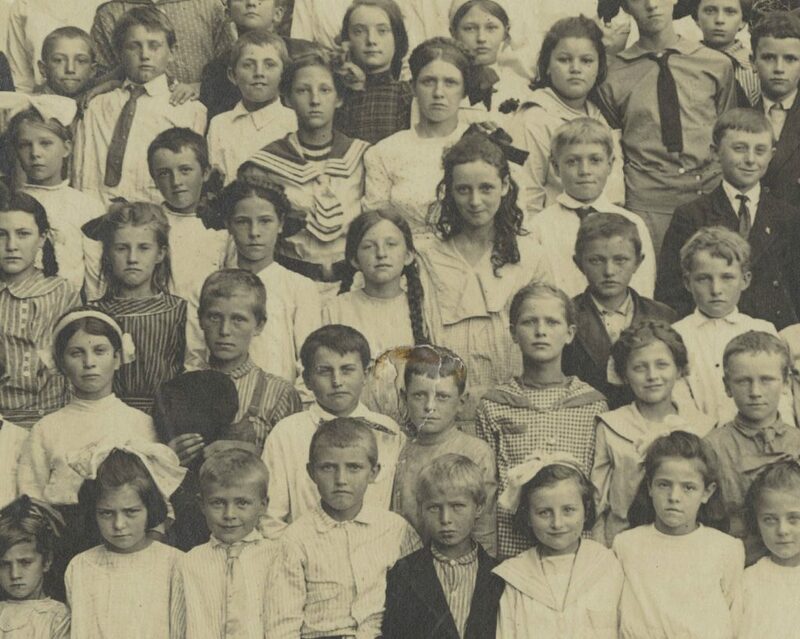 Genealogists are probably our biggest users here at DigitalNC and we love the blog we’re highlighting today because it gives us some great insight into some of the finds one particular genealogist is making using DigitalNC. Taneya Koonce is a fellow information science professional and also an avid genealogist. On her personal blog, Taneya’s Genealogy Blog, she chronicles her work to trace her family’s history and the resources she uses to do so. 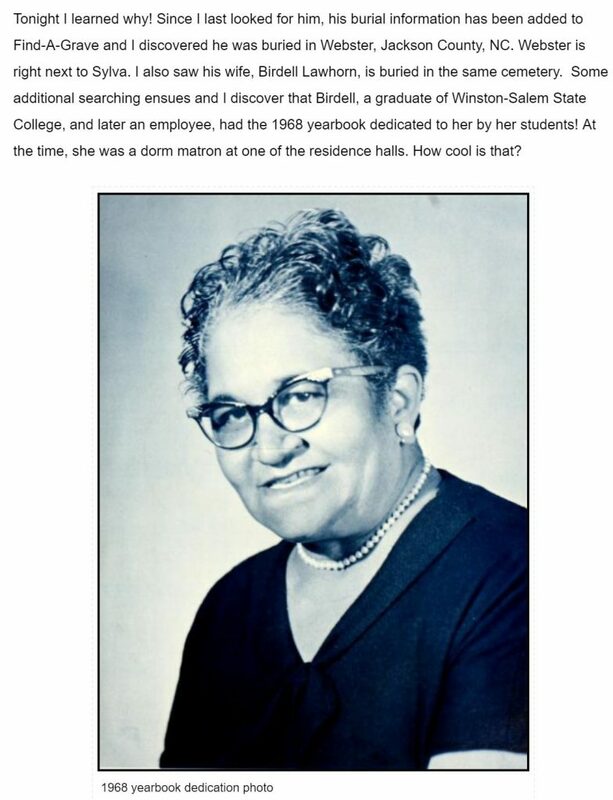 A really great example of the way Ms. Koonce has used DigitalNC for her research is her post titled “And Now I Know Why” which shows how she traced why her great grandfather’s brother died in Sylva, NC, a place the family had not had any obvious connections to, which involved looking at yearbooks from Winston-Salem State University and their student newspaper, both of which can by found on Winston-Salem State University’s partner page. To see more posts about Ms. Koonce’s use of DigitalNC in her family history research, view all the posts tagged DigitalNC here. If you have a particular project or know of one that has utilized materials from DigitalNC, we’d love to hear about it! Contact us via email or in the comments below and we’ll check out. To read about other places on the web that feature content from DigitalNC, check out past blog posts here. We love hearing about ways that materials digitized through the North Carolina Digital Heritage Center have impacted research and recreation. We thought since they have done such a great job highlighting us, it’d only be fair to turn around and highlight a few we’ve found recently. 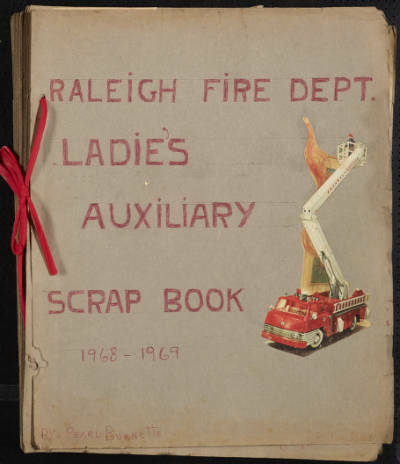 Our focus today is a particularly fun one because the author of the blog is not only a heavy user of DigitalNC, but also our main contact for one of our partners, the Raleigh Fire Museum. Mike Legeros’s Fire Blog provides a very detailed look into the history of fire departments in North Carolina, as well as keeping up to date on what’s going on in those departments today. 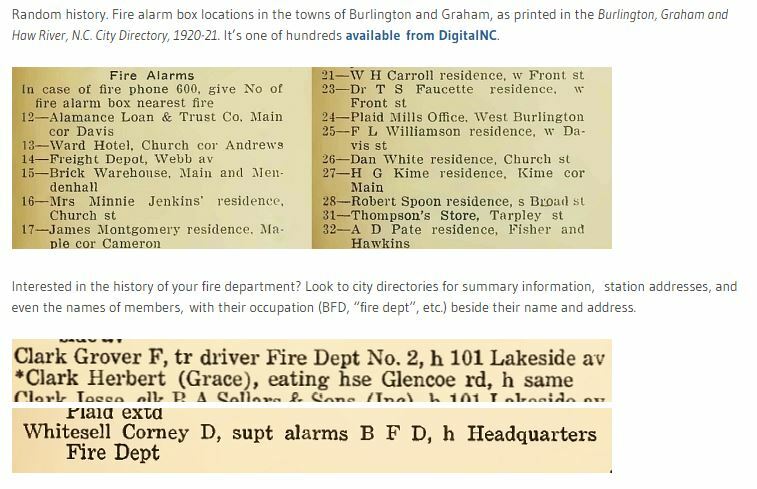 It also links to a Fire History page, which has resources of the history of fire departments across the country, including historic and present day photographs of fire stations. If you have a particular project or know of one that has utilized materials from DigitalNC, we’d love to hear about it! Contact us via email or in the comments below and we’ll check out. We are one of 29 finalists for the Institute of Museum and Library Services 2018 National Medal for Museum and Library Service. Now through April 13, IMLS is asking the people who have been impacted by the Digital Heritage Center to share their stories. If you have a story you’d like to share, we’d love to hear from you! Please contact us or share via social media by tagging us on Facebook (@NC Digital Heritage Center) or on Twitter (@ncdhc). Today’s story comes from Ross Cooper, Adult Services and Reference Librarian at Watauga County Public Library. 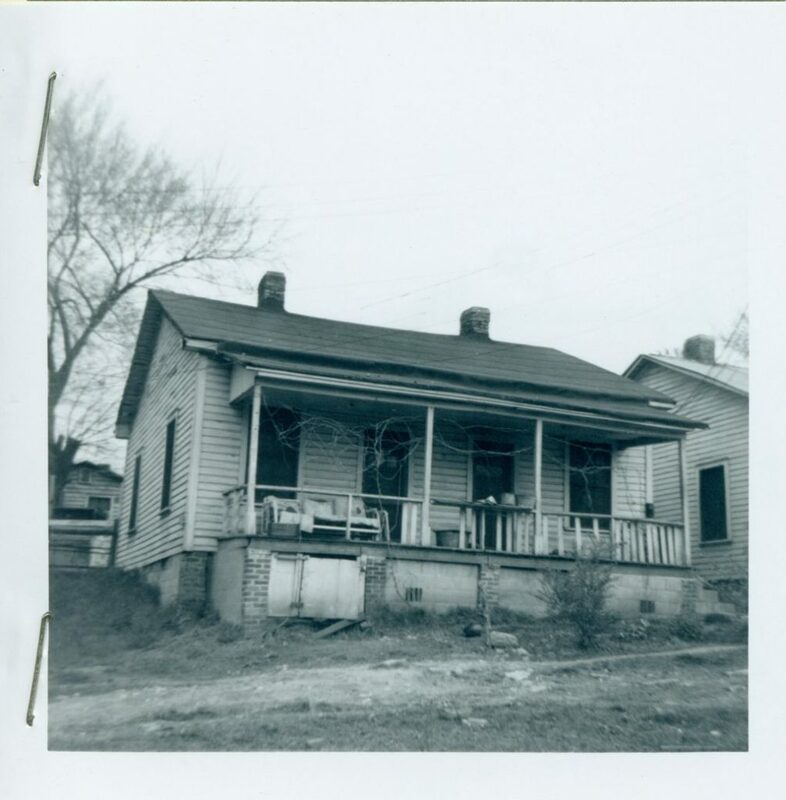 We’ve worked with Watauga County Public Library to digitize a wide variety of photographs from their “Historic Boone” collection. They have steadily increased their local capacity for digitization and now make collections available to a broader audience at Digital Watauga. “As a Reference Librarian at the Watauga County Public Library in Boone, North Carolina, I was fortunate to have been present when, with the help of the North Carolina Digital Heritage Center, our institution became first involved with historic preservation and digitization. A local group called Historic Boone wished to bequeath the historic images which their group had gathered, described, and cared for over several decades into the caretaking of our library, some ten years ago. Our then-County Librarian accepted the items and made a space for them. I was privileged at about the same time to attend a North Carolina Library Association annual conference presentation in which Nick Graham and Lisa Gregory of the University of North Carolina and the State Library of North Carolina presented on the ways that small public libraries and other institutions with limited resources might take some small steps towards preservation, scanning, and digitized sharing of materials within their collections which hold historical significance. This led us to a few small first attempts, including a blog-format web site with a few, piecemeal, scanned images. The offer of off-site digitization by the NC Digital Heritage Center which was additionally presented at this conference eventually led our library to transport the entire photograph archives of the Historic Boone society to the University of North Carolina to be digitized and shared online via www.digitalnc.org. Today’s story comes from Dawn Schmitz, Associate Dean for Special Collections & University Archives at UNC Charlotte. 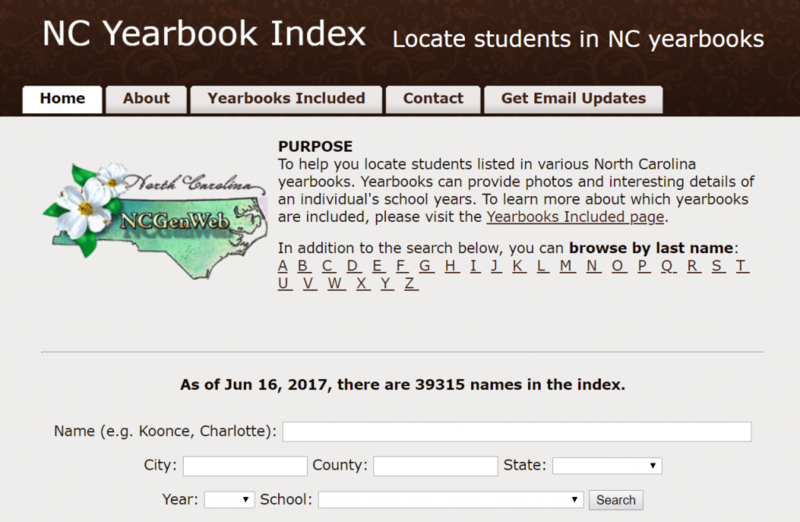 We’ve worked with UNC Charlotte to digitize campus publications as well as, most recently, Q-Notes (mentioned and linked below). They have their own robust and growing digital collections site, which includes among other things motorsports photographs, papers documenting key figures in Charlotte history, and oral histories. Dawn’s comments are shared here today with permission. Front page article from the April 26, 2003 issue of Q-Notes. 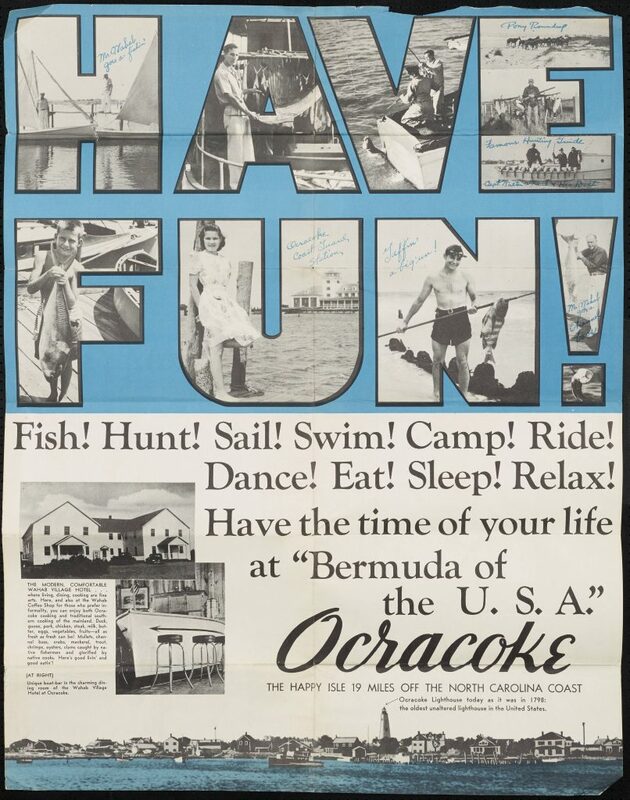 Today’s story comes from Philip Howard, past president of the Ocracoke Preservation Society. The materials we’ve worked with OPS to digitize have helped the Society’s ongoing efforts at historic preservation. One specific effort is the Society’s work on behalf of the Island Inn. A local group is hoping to purchase the property to protect it for the future and open it up for community use. Resources digitized and available on DigitalNC.org have helped them document that building’s known and hidden history. Today’s story comes from Professor Robert C. Allen, Professor in the Department of American Studies at UNC-Chapel Hill and faculty lead of the Community Histories Workshop. Dr. Allen shared the thoughts below in support of our Medal application and we reshare them today with his permission. “Since 2013, I have been working closely with the N.C. Digital Heritage Center on ‘Digital Loray,’ the most ambitious public humanities program ever undertaken by UNC. This project uses the adaptive reuse of an iconic industrial structure—in this case, Gastonia’s Loray Mill, one of the largest cotton mills built in the state—as a catalyst for a long-term community history and archiving initiative. The ‘heart of this open-ended project is an archive of more than 2500 digital objects, brought together in a single interface from the UNC North Carolina Collection and other Wilson Library collections, other institutional archives, community cultural heritage organizations, churches, and individual community contributors. 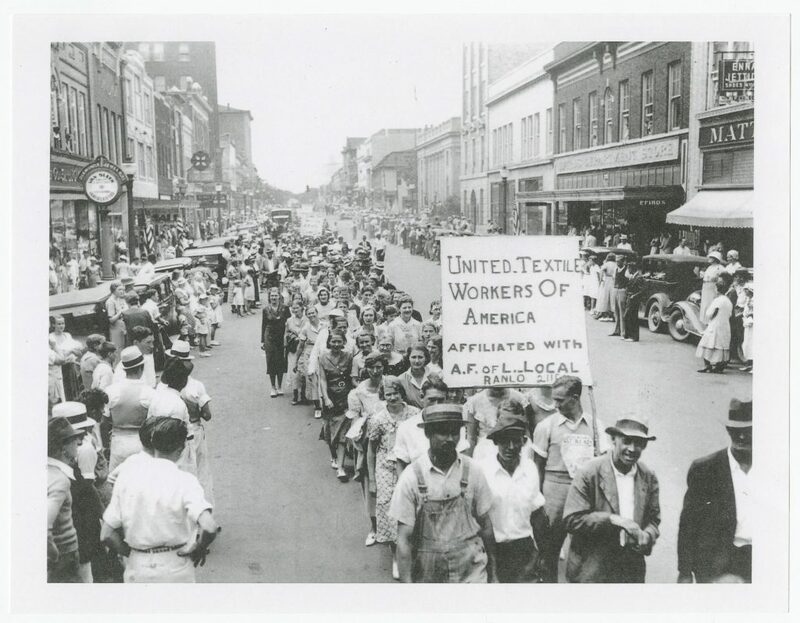 “In short, I could not extend my teaching, graduate training, and the work of my unit into communities in North Carolina without the invaluable assistance of the N.C. Digital Heritage Center. But I am not the most important beneficiary of its effectiveness and leadership: it enables hundreds of small museums, public libraries, historical societies, and other cultural heritage organizations to add a digital dimension to their work and, in doing so, to preserve and share the histories of their communities. These perennially threatened local organizations can undertake what otherwise would be impossibly expensive and technically complex digitization projects without the need for technical specialists or third-party software and hosting solutions. “The N.C. Digital Heritage Center should be a model for other states. It deserves much more attention on a national level than it has received, particularly in the realms of public history, digital history, public humanities, and digital humanities. I have reviewed and attended presentations about ‘sexier’ and much better resourced projects over the past few years, but none I think has had a greater or longer-lasting impact than the quiet but profoundly important work of my colleagues in the N.C. Digital Heritage Center. I congratulate them and thank them for all they do to make my university a great resource for the people of North Carolina. Today’s story comes from Taneya Y. Koonce, a native North Carolinian, information professional, and a well known genealogist. She shares her research and methods on Taneya’s Genealogy Blog and her new Koonce surname site. One of her projects includes indexing names from digitized yearbooks to help improve searchability by transcribing names. Taneya shared the thoughts below in support of our Medal application and we reshare them today with her permission. “My interest in the NCDHC stems from my passion for researching family history and genealogy. I am a native North Carolinian and over the past 12 years I have been an active participant in the online genealogy community as I’ve researched not only my own family tree, but aided in the research of many others. I have high visibility in the genealogy community and maintain leadership roles in the national USGenWeb Project, a volunteer-driven group that provides free resources to individuals researching their family heritage. I am currently the Assistant State Coordinator in the North Carolina-focused component of the project (the NCGenWeb) and work closely with researchers from across the country who have family roots in the state. I spearhead several projects designed to further maximize the reach and impact of the NCDHC work (such as an online index to graduating seniors listed in the yearbooks from the digitized yearbook collection), and have become intimately familiar with the Center’s collections.